Full Tang Chrome Collar Samurai Katana Sword | BUDK.com - Knives & Swords At The Lowest Prices! This sword is constructed from a single piece of stainless steel from tip to pommel for maximum strength. 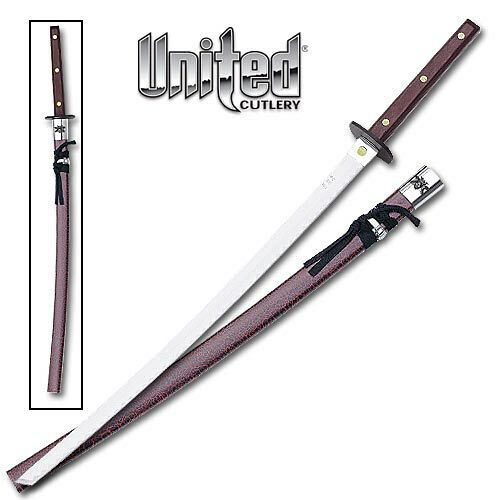 This sword measures 37" overall and is designed with full tang construction and a 28" 420 J2 stainless steel blade. The handle is made from laminated wood with brass pins, impact resistant black guard, cast metal parts, and chrome plated finish. This item includes an aluminum scabbard with a red crinkle finish. United Cutlery, 1150S.